Ht / Wt: 5'10" / 192 lb. 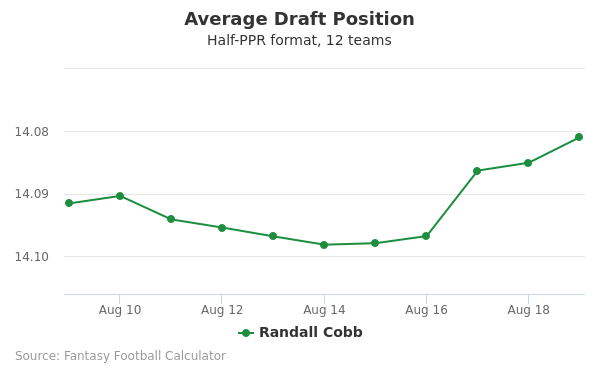 Randall Cobb's fantasy value is measured by his average draft position (ADP) in fantasy football mock drafts. 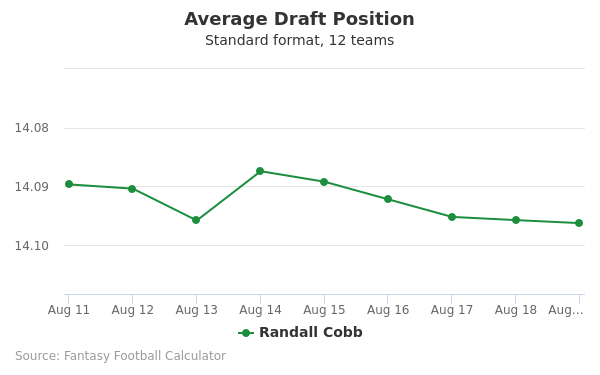 In recent drafts, Cobb's current ADP is 15.05, which indicates that his fantasy outlook is to be the 5th pick of the 15th round, and 172nd selection overall. 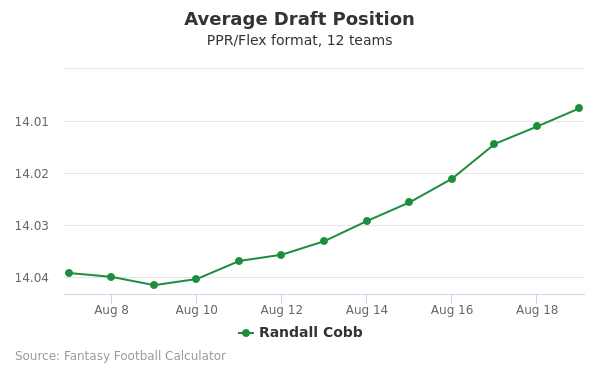 The code below will display a graph that updates every day to show the ADP data for Randall Cobb for the past 30 days in 12-team PPR leagues. 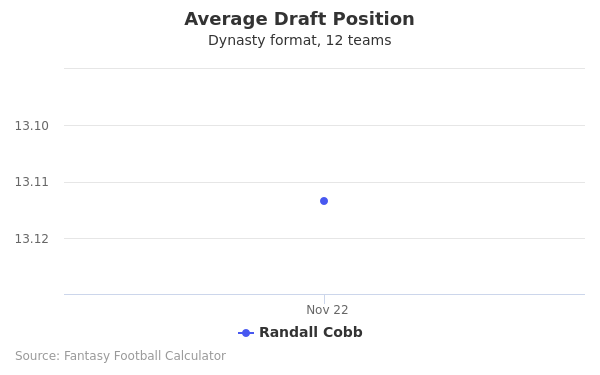 Draft Frank Gore or Randall Cobb? Start Frank Gore or Randall Cobb? Randall Ladonald Cobb II was born on August 22, 1990 in Maryville, TN, at the foothills of the Great Smokey Mountains. He played high school football in neighboring Alcoa, TN at Alcoa High School, where he also starred in basketball and track and field. While at Alcoa, Cobb played both the QB and DB positions, earning the 2007 Tennessee Titans Mr. Football honors for backs for Division 2A schools. Cobb, at QB, led Alcoa to four state championships in football. Additionally, as a track star, he competed in the 4 X 100m, and 4 X 200m relays, and 100m, and 200m individual races. As a junior he finished second in state as a member of the 4 X 100m relay team for Alcoa and third in state in his senior year for the 100m dash. Cobb attended the University of Kentucky beginning in 2008 as a member of the Wildcats college football squad at QB. As a freshman he started four of 11 games at the position and earned a spot on the SEC All-Freshman team at QB. Playing in the “Wildcat” offense, he scored 11 TDs, including seven rushing, two passing, and two rushing. During Cobb’s sophomore season he evolved into a WR along with a role on the special teams as a return specialist. He scored 15 TDs during the season, including 10 rushing TDs. One of the highlights of Cobb’s college career came in a game against the number 8 ranked Tigers of Auburn in his junior year. Cobb scored 4 TDs in a 37-34 loss. This included 1 passing, 2 rushing on 11 carries for 47 yards, and 1 receiving TD on 7 receptions for 68 yards. Cobb was also the holder on the extra point attempts during the game. Cobb entered the NFL draft in 2011. At the NFL Combine in Carlsbad, CA, he handed in a 40 time of 4.46 seconds and recorded a vertical leap height of 33.5 inches. He was selected by the defending World Champions Green Bay Packers with the 64th pick overall in second round. He was offered a contract salary in his rookie year of $375,000. Cobb completed a contract extension prior to the start of the 2015 NFL season. The new contract offered a salary of $40 million over four years, with $17 million in guaranteed salary. An injury to teammate Jordy Nelson pushed Cobb into the number one WR position. He would finish the season starting all 16 games with 79 receptions for 829 yards receiving and 6 TDs. The highlight of the season for Cobb came in a December 2015 game versus the Detroit Lions. Cobb recovered a fumble by teammate James Starks into the end zone for a TD. That play gave the Packers their first points in teh game and, down 7-20 at that point, led to a 27-23 comeback victory when QB Aaron Rodgers hit TE Richard Rodgers with 0:00 seconds on a 60 yard Hail Mary pass in the end zone. Cobb played in 13 of 16 games for the Packers during the 2016 season. He finished the season with 60 receptions for 610 yards and 4 TDs. In post season games against the New York Giants (Wild Card), Dallas Cowboys (Divisional), and Atlanta Falcons (NFC Championship), he made 18 receptions for 260 yards and scored 3 TDs. Cobbs parents are Randall Sr. and Tina Cobb. While at Kentucky, he majored in Community Communications and Leadership Development. Although he left school after his junior year, he returned to finish his degree in 2016. Cobb can be reached via Twitter at @rcobb18.